Sameer Rastogi, Managing Partner, India Juris, has advised & represented clients from almost all the major countries in various business sectors. His areas of practice include Corporate laws, Foreign Exchange Laws, FDI, JVs, Foreign Collaborations, M&A, Capital Markets, and more. Sameer has been nominated as Asia leading lawyer 2012 for corporate / M&A in India. He is also a recommended Lawyer by Practical Law Company, U.K. for corporate & business matters and Equity Capital Markets in India. India Juris is one of the leading full-service international law firm providing services to global clients from various continents. The vision of the firm is to be a leading international law firm, advising governments, global corporations and financial institutions on their most challenging and complex transactions and disputes. 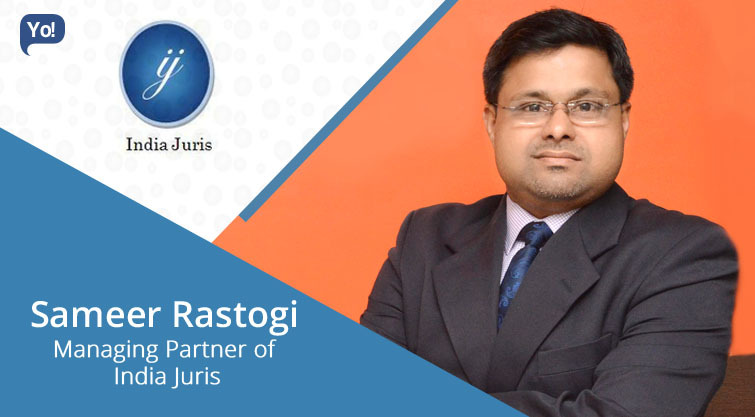 From some time now India Juris has been engaged with many startups and have been providing legal, regulatory and corporate services and also have been providing Pro-Bono services to many startups that are having financial crunches. Passion for legal profession and urge to provide best legal services in India for Indian and Foreign Clients. Initial struggle while starting my own Legal Firm. It was very difficult to sustain among big law firms and legal service providers in the Market. Continuous practice and always ready to learn new things have definitely helped me a lot In the initial stages of my Journey. One has to be very focused and determined for its goal and always remember that there are no shortcuts to success. From the very start I have believed in giving qualitative service rather quantitative. India Jurishave always tried to maintain a balance of young and experienced lawyers in the firm because we have always believed with experience and maturity a firm also needs young and energetic minds. We put every effort to retain the best talent in the firm by providing excellent learning opportunities and growth prospects. Expansion of law firm and increase firm’s strength to 100 lawyers. Would like to do extensive and more ground work.